Fact Sheet: When Do I Need a Plumbing Permit? 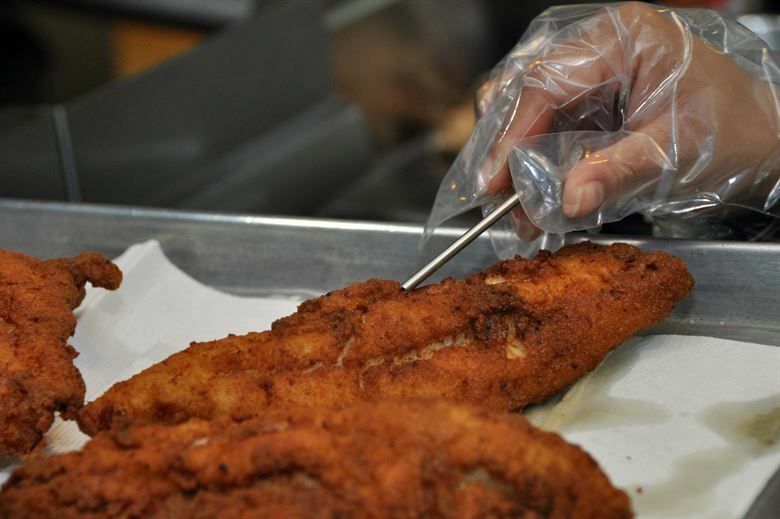 It’s Lenten Fish Fry season! Though your organization may be exempt from licensure and inspection, it is important to take all steps necessary to serve food that is safe for consumption. Obtain food from approved sources. Water used must be potable and safe to drink. Store in clean containers. Keep food items such as meats, dairy products and side dishes cold until ready for cooking. Keep under 41ºF at all times. When using coolers, completely surround food products with ice. Monitor closely and change ice when needed. When holding hot foods, keep foods above 135ºF. Otherwise, bacteria could grow in the food. Keep a food thermometer handy to monitor cooking temperatures. Any outside vendor or mobile food service that is charging a fee or making a profit will need to obtain the proper food licenses. These outside vendors are exempt only if they do not charge for their services or all money collected is donated back to the event organizers. If a license is required, contact Hamilton County Public Health at 946-7800 with any questions or to obtain license applications. You may also visit our Web site at www.hamiltoncountyhealth.org. Wash, rinse and sanitize utensils every 4 hours or when they become contaminated or dirty. Have spares available in case utensils are dropped on the ground or otherwise contaminated. Keep all trash cans covered. Store all trash away from food and food preparation areas. Dispose of all trash properly into a dumpster when cans become full. apron strings) hanging from your clothing. Have a fire extinguisher close by at all times. Keep the cooking area clean, so oil will not splatter onto nearby items, possibly starting a fire. Water and oil do not mix, so be sure not to put wet utensils into boiling oil. Add food to the oil slowly, being careful not to “drop” items into the boiling oil. Never leave boiling oil unattended. All food preparation and service should be done indoors or under covered tents to protect against contamination. Set up a portable hand sink, water tank or cooler with a spigot to act as a handwashing station. Have soap and paper towels available. Wash hands often! Raw food juices contain harmful bacteria. Wear gloves when handling ready-to-eat food. Change gloves when they become contaminated or dirty. Food workers should wear hair restraints/hats. Hand sanitizer is NOT to be used as a substitute for handwashing. Do not smoke, eat, or drink while preparing or serving food. Contact your fire and zoning departments to ensure your operation meets any requirements. Non-profit organizations may attend Hamilton County Public Health’s bimonthly food safety classes at NO CHARGE. Classes occur on the first Tuesday of the month at 9 a.m. and the third Thursday of the month at 1:30 p.m. Call 946-7800 for more information or to register for classes. If you have questions, please contact our Environmental Health Division at (513) 946-7800. Download a printable version of this fact sheet here.